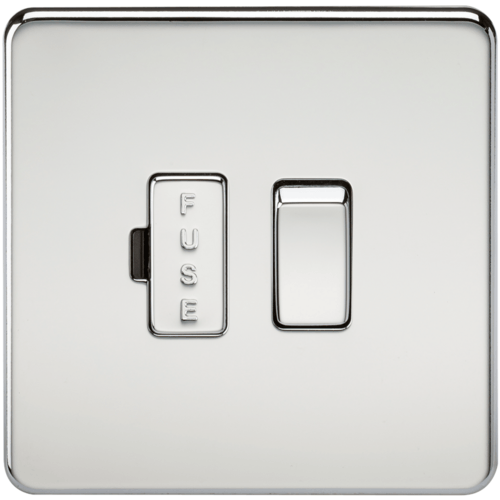 The Knightsbridge SF6300PC Screwless switched fused spur unit or fused connection unit in Polished Chrome is an electrical switch with a built in 13 amp fuse and designed for appliances that do not have or require a fused plug top. Fused spur units are also used for high powered electrical equipment with heavy continuous loads, so that the appliance can be isolated by a single cable from a ring main for safety and maintenance purposes. The decorative plate features an easy clip on cover with internal gasket for moisture protection and matching screws. It has an ultra slim profile and is made from high quality ultra slim, premium grade material and complete with integral gasket. A light weight and compact unit with measurements Width 87.5mm x Height 87.5mm with a minimum mounting depth of 25mm. Complies to all relevant safety standards and comes with a 15 year manufacturer guarantee. This product is also available in Brushed Chrome, Black Nickel, Matt Black, and Polished Brass.